H1N1 virus presents minimal health risk to pigs but farmers should take precautions. The highly publicized H1N1 virus, more commonly known as the â€œswine flu,â€� has had people across the U.S. vigorously washing their hands and applying hand sanitizer after every cough and sneeze. However, no case of H1N1 has been detected in American pigsâ€”that is, until this week. On Monday, the USDAâ€™s National Veterinary Services Laboratory confirmed the first case of the H1N1 influenza virus in an American pig. The sample was collected from a show pig at the Minnesota State Fair at the end of August and tested as part of a research study done between the University of Iowa and the University of Minnesota, documenting cases of the flu in places where pigs and humans converge. The H1N1 flu virus is a respiratory disease that affects pigs similarly to how it affects humans, says Peter Davies, a professor in the College of Veterinary Studies at the University of Minnesota. Symptoms include a fever, sneezing and coughing; however, some infected pigs might show no signs at all, such as the case with the Minnesota fair pig. Although H1N1 will spread quickly when introduced to a herd, sick pigs will show symptoms for seven to 10 days and then recover. There is little risk for mortality, Davies says. â€œIt doesnâ€™t appear to be any more problematic than the influenza that has been in the industry for decades,â€� he says. However, the USDA, along with veterinarians and the National Pork Board, has been urging pork producers to intensify their biosecurity measures to prevent the spread of H1N1 among livestock. According to Davies, this means taking the same precautions that humans take when trying to avoid the disease. Most anti-virals are too expensive to treat sick pigs with and are not licensed for use on pigs, he says. Antibiotics can be used to prevent secondary diseases like pneumonia from occurring, but usually farmers do not administer any treatment. Even preventative measures, such as vaccinations, do not seem to give significant protection, he says, because H1N1 is not a significant threat to pig health. The USDA and other health organizations continue to iterate that H1N1 poses no food safety risks. â€œI want to remind people that they cannot get this flu from eating pork or pork products,â€� Agriculture Secretary Tom Vilsack says. Although, this is the first confirmed case of H1N1 in a pig in the United States, other countries, including Canada, Argentina and Australia, have reported seeing the strain in their livestock. The virus became known as â€œswine flu,â€� Davies says, because the H1N1 strain has elements of genome found in two different swine viruses, but it also contains elements of avian and human influenzas. â€œWhether the new virusâ€”the hybrid virusâ€”originated in swine or people, we will probably never know,â€� he says. A pig herd in the Norwegian county of Nord-Troendelag has been found infected with H1N1 and has now been quarantined. The Norwegian Food Inspectorate is now carrying out testing a number of pig breeding farms. â€œWhat has happened is that the animals have received the infection through contact with a human who has been carrying the disease. We take this very seriously, since we have never before encountered pigs with swine flu in Norway, said Kristina Landsverk, director of the Norwegian Food Inspectorate. Employees who suspect they may be carrying the virus have been told to stay away from the barn. ARGENTINA - The veterinary authorities have sent a report to the World Organisation for Animal Health (OIE) about an outbreak of influenza A H1N1 on a pig farm near Buenos Aires. The Argentinian veterinary authority sent an Immediate Notification dated 25 June to the OIE. The farm is at San AndrÃ©s de Giles in Buenos Aires province. The outbreak started on 15 June on a farm with 5,586 pigs, of which 1,676 were affected. The report states that the farm has with biosecurity measures in place and its own restocking system; a 4.5-hectares area. There are no other animal species in the farm. The distribution of the animals is as follows: 516 sows, seven hogs, 2,900 castrated pigs, 58 young sows and 2,105 sucking pigs. The report adds that between 7 and 9 June 2009, two workers of the farm showed flu signs but they did not consult a doctor nor made diagnostic tests. The farm has its own restocking system. The last entry of animals occurred in July 2008. The farm applies biosecurity measures and the animals only leave the farm for slaughter. The source of infection is under investigation. Since 24 June 2009, no clinical signs have been observed in the animals at the farm, according to the report. July 7 (Bloomberg) -- A new strain of H1N1 flu sickened at least two workers at a pig farm in Saskatchewan, Canadian health officials said. 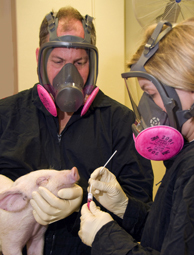 Tests found the strain is different from the pandemic swine flu circulating the globe. The two people recovered from mild illness, and a third case is under investigation, according to a government statement. Pigs from the farm tested positive for a common version of swine flu and didnâ€™t carry the new human version found in the workers. The risk of the virus is considered low, though disease trackers are testing other workers and continuing to monitor herds, the government said. Health officials worldwide are on heightened alert after a human swine flu virus, identified in April, flashed across the globe infecting at least 1 million people in the U.S. alone, according to the U.S. Centers for Disease Control and Prevention. The new Canada strain is made up of genes from human seasonal flu and genes from swine flu viruses, according to the statement from the Public Health Agency of Canada. To contact the reporter on this story: Tom Randall in New York at [email protected]. The first steps have been taken towards the filing of a wrongful death lawsuit against Smithfield Foods, the worldâ€™s largest pork producer whose unsanitary conditions may have lead to the outbreak of the H1N1 virus. For once I smell justice in the air, and not just the stench of negligence and cesspools of manure. The petition for the suit was started by Steven Trunnell, whose wife Judy Dominguez Trunnell was the first U.S. resident to die of the H1N1 flu, and would be the first of itâ€™s kind to hold a corporation responsible for the inadvertent creation of an infectious disease. While Smithfieldâ€™s massive pig farm in Mexico was linked to the virusâ€™ outbreak early on, the lawsuit could provide a clear indication that factory farming endangers the public by creating enormous health risks. The lawsuit will not be an easy battle as the pork industy is powerful and it may be difficult to prove that one corporation is responsible for raising the risk of the outbreak, but a great deal of evidence already exists to show that factory farm conditions serve as breeding grounds for disease. If the petition goes through there is also a chance that the case could become a class action lawsuit, involving other H1N1 victims. And if the lawsuit reveals that Smithfield is accountable for contributing to the spread of the virus, hopefully steps can be taken to prevent future outbreaks and deaths by putting an end to factory farming. Factory farming and long-distance live animal transport apparently led to the emergence of the ancestors of the current swine flu threat. A preliminary analysis of the H1N1 swine flu virus isolated from human cases in California and Texas reveals that six of the eight viral gene segments arose from North American swine flu strains circulating since 1998, when a new strain was first identified on a factory farm in North Carolina. This genetic fingerprint, first released by Columbia Universityâ€™s Center for Computation Biology and the Institute for Advanced Study in Princeton, has now been reportedly confirmed by researchers at the University of Edinburgh, St. Jude's Children's Research Hospital and virologist Ruben Donis, chief of the molecular virology and vaccines branch at the U.S. Centers for Disease Control and Prevention. Dr. Robert Webster, the director of the U.S. Collaborating Center of the World Health Organization, and considered the "godfather of flu research," is reported as saying "The triple reassortant in pigs [first discovered in the U.S. in 1998] seems to be the precursor." The worst plague in human history was triggered by an H1N1 avian flu virus, which jumped the species barrier from birds to humans and went on to kill as many as 50 to 100 million people in the 1918 flu pandemic. No disease, war or famine ever killed so many people in so short a time. We then passed the virus to pigs, where it has continued to circulate, becoming one of the most common causes of respiratory disease on North American pig farms. In August 1998, however, a barking cough resounded throughout a North Carolina pig factory in which all the thousands of breeding sows fell ill. A new swine flu virus was discovered on that factory farm, a human-pig hybrid virus that had picked up three human flu genes. By the end of that year, the virus acquired two gene segments from bird flu viruses as well, becoming a never-before-described triple reassortment virusâ€”a hybrid of a human virus, a pig virus, and a bird virusâ€”that triggered outbreaks in Texas, Minnesota, and Iowa. Within months, the virus had spread throughout the United States. Blood samples taken from 4,382 pigs across 23 states found that 20.5% tested positive for exposure to this triple hybrid swine flu virus by early 1999, including 100% of herds tested in Illinois and Iowa, and 90% in Kansas and Oklahoma. According to the current analysis, published April 30 in the journal of the European Centre for Disease Prevention and Control, it is from this pool of viruses that the current swine flu threat derives three-quarters of its genetic material. So where does the other quarter come from...?